HELLO READERS WE HAVE ADDED ANOTHER ICO PROJECT IN OUR WATCH LIST. Fiiicoin is a cryptocurrency created with long-term stability and industrial viability in your mind, is designed to overcome all these constraints — and in a brave new world of borderless spending, it is set to redefine the way cryptocurrencies are used, processed and handled entirely. FiiiCoin is a transaction network specifically designed for mobile devices mining purpose only. The blockchain technology enable all mobile devices participate in maintaining the blockchain network while leaving it idle and charging battery instead of relying on expensive and powerful computer hardware running 24/7 to do the mining work. The main objective is to create a least effort way and promote re-using the existing available resources(mobile devices) together to take part in maintaining the blockchain. Even the non-IT people or non-crypto fans can easily learn and involve in mining as long as they at least have a smartphone. In fact, smartphone or any other mobile devices are not suitable to be setup as a blockchain node. The reasons are the computing power is weak, storage capacity is limited to keep a full blockchain and battery powered device are not meant to be 24/7 running all time, and it requires high network bandwidth to synchronize blocks data. If the mobile device runs the node using 4G network, it will finish up all the bandwidth in no time. FiiiCoin is built using an enhanced version of Proof-of-Capacity consensus algorithm — Delegated Proofof-Capacity (DPoC) to achieve the mobile mining capability while keeping the mobile device from being a full node and perform extensive block synchronization work. FiiiCoin is developed using an in-house built customizable blockchain technology — FiiiChain. FiiiChain provide standard blockchain modules with the “plug-and-play” capability for developers to modify the blockchain characteristic base on the given business requirement. Smartphone devices are not good at mining due to their limited storage capacity, weak computing power, low battery due to which mobile device is not capable of maintaining block-chain network 24/7. For synchronizing data in block-chain system mobile networks require 4G technology and if we run up node then mobile can finish up all bandwidth in no time. Fiiicoin mining consensuses are proof of capacity and proof of delegated capacity algorithms that will achieve mobile mining and enable mobiles to fully synchronize with their network. Fiicoin is a peer to peer network architecture that will connect constantly with multiple nodes to synchronize data within the same network. P2P mean that node connected to server has same privileges and communication capabilities that other have in flat topology. It will also provide other additional services to routing system that will enhance the performance of peer to peer network and new nodes will able to easily access to other nodes within the network. Fiiicoin network contain several master nodes that are distributed worldwide and providing data synchronization service and helping new nodes to find other nodes quickly. Similarly to bitTorent it also has a global tracker system that seeds all active nodes and provides all IP addresses to newly joined node. Fiiicoin is more than just a crypto wallet and offers you a simply way to shop online and make payments through Fiiipay network. It exchange has power capabilities of multi-crypto transactions and supports more than 1500 crypto coins. Their API is designed to be integrated with any website and online stores and give you an efficient method to send and receive online. Bluetooth 4.0 beacon technology payment system will be used that will broadcast custom pay load data that contains user identity information. FiiiPOS terminal will detect custom pay load and process payment request. FiiiEX is a crypto-currency exchange that will allow users to trade crypto currencies online just like other present exchanges. Only the main different will be it will work under the FiiiGroup and supports FiiiPay and FiiiPOS through trading. Their exchange will be linked to their app to check out latest price or trade simultaneously. Envisioned as the ultimate “benchmark” cryptocurrency, FiiiCOIN was developed following in-depth studies of the design, structure, strengths, and weaknesses of major leading cryptocurrencies. These insights were then translated into the design of FiiiCOIN, resulting in a cryptocurrency that is resolute and robust in design, possessing all the strengths of major cryptocurrencies yet without most of their weaknesses. easy to use & simplified design. FiiiCOIN is poised to emerge as a daily use currency, accepted & available everywhere. 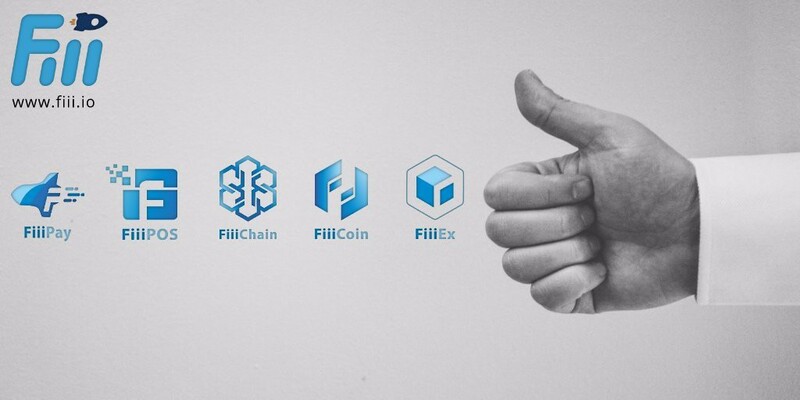 widespread use of various FiiiGROUP-issued hardware and solutions further adding to FiiiCOIN’s stability & commercial app. accepted anywhere around the world, users no longer have to worry about acquiring local currency when traveling. powered by Lightning Network where transactions can be completed almost instantly. unique DPoC design where mining productivity is largely dependent on memory space rather than raw processing power. users can freely use, accept, transfer or exchange FiiiCOIN as the transaction fees are attractively low.